I have to begin by saying and meaning it wholeheartedly, this sauce will change your life forever. The sauce has coined the name, "Dot's Sauce", because my Grandmother's best friend, Dot, came up with this amazing recipe. For years now it has become a bi-weekly (or more) thing for my family. In college, I started making this recipe for friends and it has been a hit to everyone who has been able to experience the goodness that is Dot's sauce. My Dad usually makes it by grilling some sort of lemon-pepper chicken and basting it at the end with the sauce. With it being so cold, standing outside to grill is not ideal right now, so I thought, "why not make a roasted chicken with Dot's sauce?!". Fresh herbs + lemons on the inside, onions and garlic underneath, and an absolutely delectable sauce basted on the outside, how does chicken get any better? It doesn't. I PROMISE you will not want to eat chicken without this sauce again, seriously. Not. Kidding. The lemons don't stay on top, thats just fine. 1. Preheat the oven to 350 degrees F. Clean insides of chicken and pat dry. 2. Scatter the onions and 4 cloves of garlic on the bottom of your roasting pan. Lightly season with salt and pepper and add the 1 tablespoon of olive oil. Toss the onions and garlic in the oil to evenly coat. 3. Heavily season the inside and outside of the chicken with salt and pepper. Stuff the chicken with the lemon, remaining 4 cloves of garlic, and bunch of thyme. Place the chicken on the bottom of the roasting pan. 4. 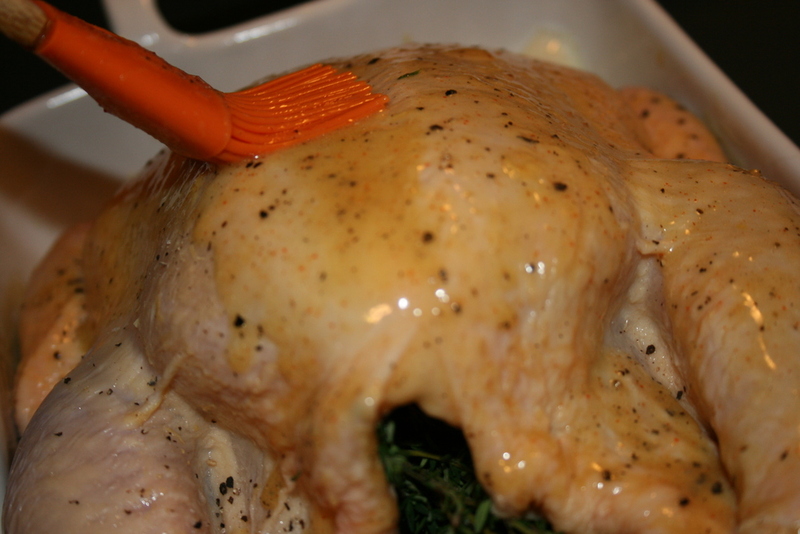 Baste the chicken with Dot's sauce (recipe below) and put in the oven for one hour. When the chicken has been in the oven for an hour take out and continue to baste with the sauce and return to the oven until the inside of the chicken reaches 165 degrees F. If the chicken starts to brown to quickly, just simply cover it! Be sure to keep an eye on it though, because the butter in the sauce will cause it to brown. 5. 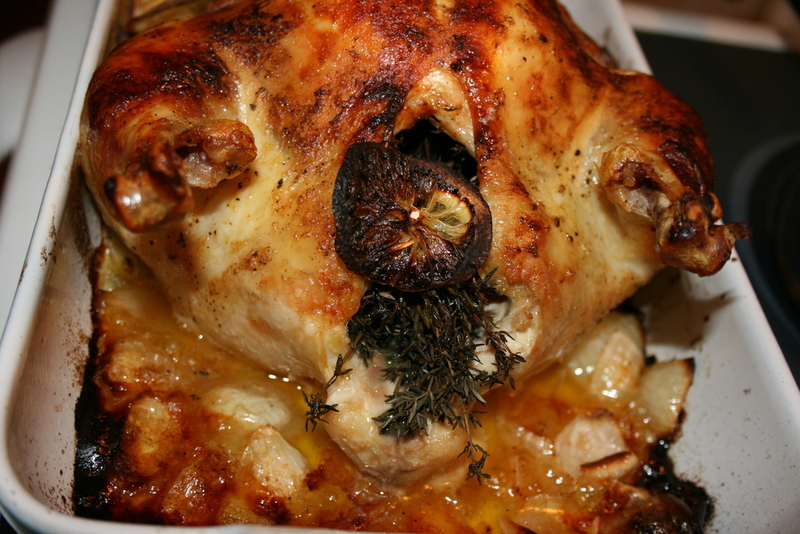 Once chicken has reached 165 degrees F, let rest for at least 10 minutes. 1. Put lemon juice, flour, red pepper, black pepper, mustard, garlic, sugar and salt in measuring cup. Fill to one cup with vinegar. 2. In a small sauce pan over medium heat, melt margarine and add other ingredients. Cook until thickened somewhat. This sauce has a tangy mustard flavor with a huge kick from the red pepper. Not for the faint of heart, but turns even the wimpiest spice eaters over to the hot side. Enjoy on any and all different chicken, but highly recommend the roasted chicken above! 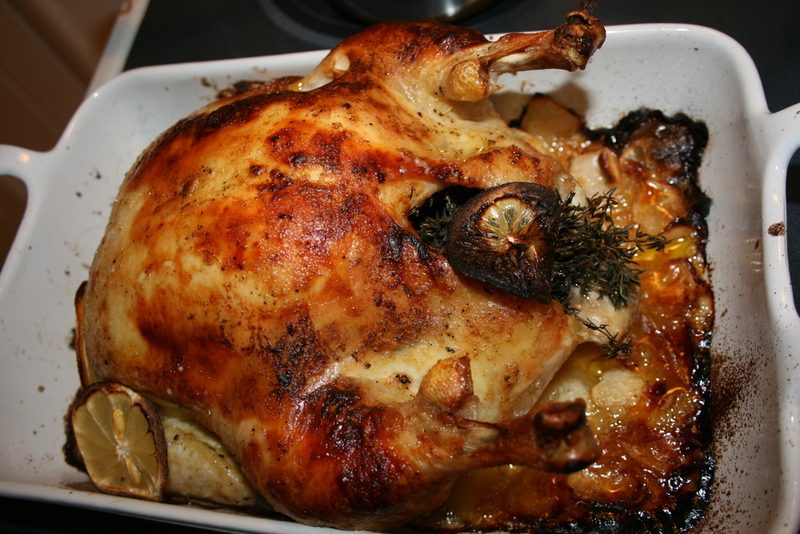 Another thing I just love about roasting a whole chicken is that they are incredible affordable! The cheapest way to get chicken most of the time. The sauce also uses ingredients that tend to be on-hand, making this such an easy recipe. Dreaming of this chicken since it came out of the oven. Wishing I was eating this for dinner again tonight.